I have way too many books! I have been pretty much preparing for this big test in December all this year. I have studied at least an hour every day and usually a lot more. That time has not been wasted as I can truthfully say that my reading and listening comprehension have noticeably gotten better since last year at this time. It really is great to feel that progress as you are studying. Last month was my final month of reading comprehension. I spent it trying to finish up the New Kanzen Master N1 Reading book. I wasn’t quite able to finish the whole book in October due to the fact that it is a pretty thick and detailed book with plenty of examples of reading samples. I was actually pleasantly surprised by how in depth the book is. I went through the New Kanzen Master N2 Grammar book and was a little disappointed because it didn’t give enough detail or explain why I got answers wrong. The N1 reading book is a lot different. It gives you detailed information on why each answer is wrong, and how to go about getting the right answer. This is really powerful! Mostly because it just doesn’t give you the answer or even a short explanation by actually goes step by step through how and why the right answer is what it is. I’m sure it will help me get more points on the reading section. I have gotten incredibly frustrated however! Not at the book, but at my self. I keep scoring 50% on the questions. This isn’t actually that bad (50% is a passing grade for the reading section on the real exam), but I’d like to do a little better than that. What I usually end up doing is being able to narrow down the answers to just two out of the four possible. Then, I inevitably have to guess. This means of course I end up with an average of 50%. There are sometimes when I completely strike out because of a misunderstanding, or a vocabulary word is not exactly clear. To improve my comprehension and just overall reading speed, I’m going back through the reading passages that took a little bit of time to answer, or that I did not clearly understand and re-read them. Some recent studies have actually shown that re-reading a material can boost your comprehension (more than just reading more material). I hope the combination of re-reading and working back through how to get the answers will boost my reading comprehension and speed enough to get higher marks on the exam. It will also help me review some of the key vocabulary that is a little more prevalent at this level. This entire month is review month, and so I’ll be working through all my drill books another time to make sure everything clicks. I think I have to beaten my listening books to death at the point. I almost have all the listening exercises memorized from listening to them so much. I do need to hit up my New Kanzen Master N1 Grammar book as well, especially the back part. The back part of the NKM Grammar books (for both N2 and N1) have a special section that zeros in on the types of questions in the grammar section and goes over some common traps that the test makers use. I also want to do at least one practice test and hopefully two practice tests before the real one. For those, I’ll be laying out my test taking strategy so that I can try to maximize my time on the exam. If you are not familiar with the grading system, the JLPT is not based on a raw score. It is graded by an incredibly complicated system called IRT. I can’t really explain what that is very quickly, but one thing to remember about it is that most people believe certain questions are still worth more than others. In other words, question A is worth 2 points whereas question B is worth only 1. This is important stuff to know because then you can decide what questions to spend more time one and what questions to simply skip over. I actually just published an update to the JLPT Study Guide Kit that contains a mini guide that goes over all the questions for all the levels of the exam and how many points each one is worth, so that you can decide for yourself the strategy that you want to use. You can get more details about the Study Guide Kit over at the premium site. What is your plan for this final month? Let me know in the comments below. Hi Mac, love the site. I’m taking the N2 in the States in less than 3 weeks, after passing N3 and N4 the past two years. I have to agree with your assessment of the Shin Kanzen Master Grammar book. A lot of times, I’m not sure why an answer is wrong, even after reviewing the correct answer. Unfortunately, it appears that knowing what a grammar term means in English is not sufficient to select the correct answer at N2 or above. Are there any other grammar books you can recommend? The Sou-Matome and Shiken ni Deru grammar books are equally poor in explaining why answers are correct or incorrect. I really like the Unicom and Shin Kanzen Master books, but do any of the other listening books go into note taking skills? I’m finding that some of the more complicated listening problems are impossible without good notes. I’ve kind of resigned myself to failing, but I’ll definitely give it my best shot! Yeah, the Shin Kanzen Master Listening text book is great for learning some much needed note-taking skills. Unfortunately, there aren’t any other listening books that go through that. And you are right, you absolutely need those note taking skills to score high on the third section and last section of questions in the listening. I would recommend refining those skills you learned in NKM Listening on practice tests and other drills books. Develop some kind of strategy for note-taking and stick with it, try to practice it to the point that it will be automatic when you get to the test, because you don’t have time to think. For grammar reference books, Jeffery made some excellent suggestions. The one book I would add to that for N3 and above is an Expression Dictionary. There are basically only two of these available for Japanese (that I know of/can recommend). The first one, I use on a regular basis. Whenever I’m a little uncertain of a grammar point, I look it up in that book. The second one is very commonly used, but I didn’t pick it up because it wasn’t as in depth for each expression, although it has more expressions than the pink book. So, if you want quantity go for the second one, if you want to details go for the first one. The Japan Times dictionaries are fairly pricey, and are incredibly thorough and detailed, but I personally only use them to research the grammar lessons I do for JLPT Boot Camp. I don’t usually use them for regular study, although if you love grammar and are the kind of person that wants to know the exact rules, they are awesome. Anyway I am studying for N3, and I am using Shin for N3 Kanzen Master N3 Grammar and the Unicom N3 Grammar book, together with the above 3 books as references. I feel that the Sou-Matome series is very weak in terms of explanations and examples and as such I don’t recommend it. 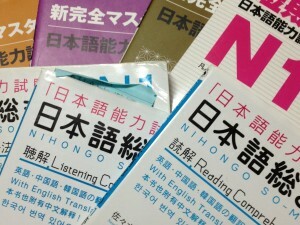 So-Matome < Unicom < SKM < Dictionaries of (basic, int, advanced) Japanese. I completely agree with your recommendations, I would just add an expression dictionary in there. Mine has come in handy many times. I’ve heard a lot of great things about Unicom as well, I haven’t used their books a lot to prep, but I might start giving them a try. Do you feel like they are the correct level for the test? I am studying for the N3 and since there is not much info regarding the exact syllabus tested, i am using both Unicom and Shin Kanzen Master to study. I can say that the Unicom series for grammar is easy to study as it gives a brief explanation on each grammar. I do not have to know so much regarding the grammars and that means less time wasted on memorizing some of the nuances of the grammars. The grammars are so brief that you end up learning the grammars by memorizing its translation in English. For the SKM, it is more detailed and is better. As to if the book covers the test, i guess yes. There are many grammar points listed in the Unicom book but as I said earlier, lack thorough explanations. It can be used as a useful brief revision kit right before JLPT exam. But, I guess the point I was trying to make is that the Japan Times books are a little overkill for the average learner, but what do you think? I mean I only use them when I’m doing research for an article, not for regular studying. Do you use them on a regular basis? Edit: Anyway I am studying for N3, and I am using the Shin Kanzen Master N3 Grammar and the Unicom N3 Grammar book, together with the above 3 books as references. I feel that the Sou-Matome series is very weak in terms of explanations and examples and as such I don’t recommend it. I’ve been using the JT Grammar Dictionaries and I think they’re great. I think my problem is that I can understand what the grammar means when seeing it being used in a sentence, but when it comes to filling in a blank and choosing among 4 options that appear to mean almost exactly the same thing, I get lost. In N2 it appears that answers are wrong for more subtle reasons than they were in the tests before. I also tend to get the phrases with koto and mono mixed up in my head. Mac, I decided to go with the white grammar usage book, as it has English explanations. I think it’s been very useful and it’s definitely easier to carry around than the 3 Grammar Dictionaries! I like the section in the back, where they show how to describe situations (place, time, etc) using increasingly more difficult grammar. I’ll study hard this week and see how Sunday goes. Good luck with your tests guys! That whole choosing the correct one situation is an issue with appropriateness and yeah, koto and mono are a totally mess. I’m just now starting to get a really good idea of what the difference between those are. Anyway, for appropriateness, that is a tricky thing to fix. You can either try to use the grammar as much as you can and have someone strictly correct you when you make a mistake, which is good if you have a tutor or classes. Or you can drill through grammar questions and take a hard look at why you got it wrong. Actually, NKM or I guess ShinKanzenMaster in Japanese has a great section at the back of their books for N2/N1 that goes over some grammar points that often get confused. As usual, NKM is lacking in clear examples and you might have to end up looking the grammar point up in a dictionary or something, but the exercises are quite valuable.